Fresno Christian learners, practiced in problem solving from kindergarten through high school, are creative and innovative. Our children are taught to use evaluative strategies, ideas, and abstractions to interpret knowledge. With 98% of graduating seniors attending college, Fresno Christian equips students to be effective communicators who are and will become dynamic leaders in the world. The goal of the FCS mathematics department is to develop mathematical literacy in our students, to the glory of God and the benefit of our students and their community. The conceptual and procedural knowledge developed in these courses will prepare our students for success in higher-level mathematics courses, and will serve them well in the world and the workplace. Advanced courses including AP Calculus and AP Statistics provide students with an opportunity to challenge themselves with university-level content while still in high school. Science is a way of thinking and problem solving. These skills are in demand in our modern world and required of our future Christian leaders. The science program at Fresno Christian provides rigorous instruction in the fundamentals of biology, chemistry, and physics, while offering higher-level exploration of the life sciences through zoology and advanced placement biology. Students explore the wonder and awe of God’s creation through hands-on laboratory experiences and classroom instruction. 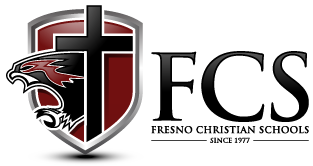 Fresno Christian High School English curriculum offers a rigorous and varied course of study to prepare students for success following graduation, post secondary education, or the workplace. The area of English language arts provides an integrated approach to the development of reading, writing, speaking, listening, and language. Students focus on critical analysis of literature and compositional skills through reading and execution of clarity, logic, tone, and style in their writing. The goal of the history department is to introduce students to the disciplines of history and social sciences. Students are challenged to develop historical thinking skills as they study history from a biblical foundation. Historical facts and figures as well as concepts, controversies, perceptions and philosophies are interwoven into the curriculum. The program encourages connections between past events, creating relevant discussions, which leads them to their role in the world today. We purpose for Fresno Christian students to become knowledgeable, ethical and responsible contributors to society. The Learning Resource Center provides support services and intensive intervention opportunities to equip students to succeed in the classroom and in life as critical thinkers and independent learners. It is staffed by credentialed teachers trained in a variety of specialized programs designed to target deficit areas through one-on-one instruction.